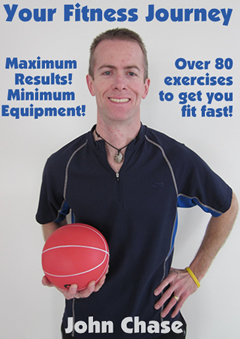 I have a new fitness toy to share with you today from the folks at Kamagon Fitness. 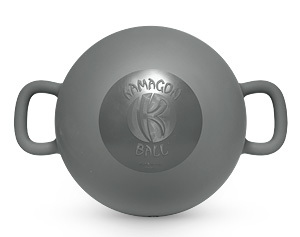 The Kamagon Ball looks like an oversized medicine ball, or an undersized stability ball, with ears. What’s really different about the Kamagon Ball is that you fill it with water. The ball has a port on one side that you pour water in to create either 15, 30, or 45 pounds of fluid resistance. Adding water to the ball introduces a concept they refer to as Hydro Inertia. Basically that means that the water inside the ball is constantly in motion and you’re body has to work a bit harder to stabilize that unstable source of resistance. That added resistance has been shown through research to recruit more muscle fibers than similar static weighted exercises. Further, the added stabilization required to overcome the water resistance helps protect against injury by forcing you to concentrate more on form and strengthen connective tissue. You can use the Kamagon Ball just like you would use a medicine ball or a kettlebell and the variety of exercises is limited only by your imagination. I’ve been incorporating the Kamagon Ball into different workouts with clients and it’s been a popular addition. I’ve been using it quite a bit in my own workouts and I’ve come to prefer it over kettlebells and medicine balls. When you receive your Kamagon Ball, it includes a brief instruction manual and DVD showing various exercises. If I have one criticism, I’d say that these two can use some work. They’re a decent starting point and your challenge from there is to think outside the box and find creative ways to use the Kamagon Ball. In addition to individual use, the folks at Kamagon Ball have created a series of group fitness programs called Kamagon Kore and Kamagon Sculpt to extend it’s use to group fitness settings. Watch the video review below to see a few examples and then watch for a series of videos in the near future highlighting different combinations with the Kamagon Ball. Is the scale your friend or foe? If you’re on a weight loss journey, it’s probably your most feared enemy, next to chocolate cake. It’s probably the first thing you consult when you wake up, even before brushing your teeth. It’s probably driving you crazy. You’ve probably heard someone say that muscle is heavier than fat too. So, which is heaver, 5 lbs. of muscle or 5 lbs. of fat? Which would you rather have. I can hear your argument. “John, muscle is more dense, so given the same volume, muscle will weigh more”. You got me. You’re right. But if you’re trying to get smaller, don’t you want to occupy less space? Swap 5 lbs. of fat for 5 lbs. of muscle and that muscle will take up less space. That’s a good thing. Not only will you be a smaller you, but you’ll be a healthier you, a more functional you, your body will burn more calories at work and at rest, and you’ll look better. Clothes will fit better too. Are you more concerned with the number on the scale or are you really trying to change how you look in the mirror and how you feel? Isn’t that the true measure of health and fitness? If you’d like more ideas to help eliminate those holiday pounds and get yourself back on the right track, I’ll be presenting ” Three Things You Must Do To Lose That Extra Weight ” at the Fountaindale Library on Tuesday, January 10, at 7pm. I hope you’ll be able to join me.